Oliver is a beautiful black dog with white highlights, who’s in need of a loving “fur-ever” home. Oliver first came to our shelter after a car accident. Sadly, he lost one of his legs as a result. Don’t feel sorry for him however, as the word “disabled” is not in Oliver’s vocabulary! Oliver is an energetic, full participant of life who can walk, run and play as well as any other dog. Oliver’s attitude to life is an example to us all. Won’t you consider opening your heart and home to Oliver? 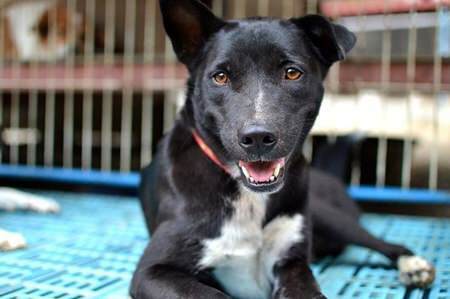 To make an appointment to meet Oliver, please email us at [email protected] or call us at one of the following phone numbers: 084 752 5255 (English) or 086 913 8701 (Thai). Oliver needs a forever home!